Odometer is 7276 miles below market average! 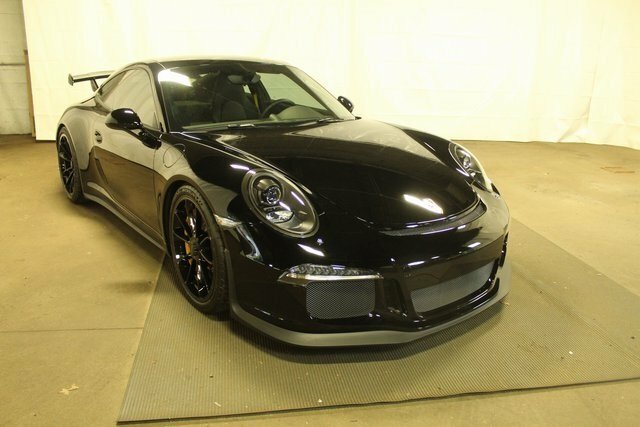 NH State Inspected, 101 Point Safety and Mechanical Inspection, Certified By Carfax - No Accidents!, Certified By Carfax - One Owner!2014 Porsche GT3 Basalt Black Metallic 911CARFAX One-Owner. Clean CARFAX.RWD 7-Speed Porsche Doppelkupplung (PDK)McPherson front axle with anti-roll bar, selected suspension mountings ball-jointed, Multi-link rear axle with integrated helper spring, anti-roll bar, selected suspension mountings ball-jointed, Six-piston aluminium monobloc fixed brake calipers at front and four-piston units at rear, brake calipers with red finish, Composite brake discs with brake chambers in aluminium, discs internally vented and cross-drilled, diameter (front/rear): 380 mm, Suspension adjustable for racing use (toe angle, camber and anti-roll bars), Electromechanical power-assisted steering with variable steering, Porsche Stability Management (PSM) including ABS, with two switchable stages (SC OFF and SC+TC OFF), 245/35 ZR 20 (front sports tires), 305/30 ZR 20 (rear sports tires), Displacement 3,996 cm3, Power (hp) 500 PS, 7-Speed Porsche Doppelkupplung (PDK), 4 Speakers, 4-Wheel Disc Brakes, ABS brakes, Adaptive suspension, AM/FM radio, Automatic temperature control, Black Bi-Xenon Headlights w/PDLS, Carbon Dashboard Trim, Carbon Interior Package, Carbon Interior Package (EGB), CD player, Door Panel Trim In Carbon, Four wheel independent suspension, Front dual zone A/C, Headlight cleaning, High intensity discharge headlights: Bi-Xenon, Leather/Alcantara Seat Trim, MP3 decoder, Porsche Dynamic Light System, Power driver seat, Radio: CDR Audio Sys w/7 QVGA Touchscreen Display, Rear fog lights, Remote keyless entry, Security system, Sound Package Plus, Speed-sensing steering, Spoiler, Sport Chrono Package Plus, Sports Seats Plus, Traction control, Wheels: 9J x 20 Fr/12J x 20 Rr Platinum.